"And leave those cones on until the vet tells you to take them off!" Gisbert ensures that a client gets to a vet appointment even if she has to pack them in herself. Photo by Jacqueline Gisbert. Anyone who understands the strong bond between homeless people and their pets also realizes that love is not enough to keep it from fraying. Jacqueline Gisbert understands it up close and personal. Gisbert is the founder of Cuddles of Love, a ministry and sanctuary housed within the homeless outreach nonprofit Beacon for Him Ministries. 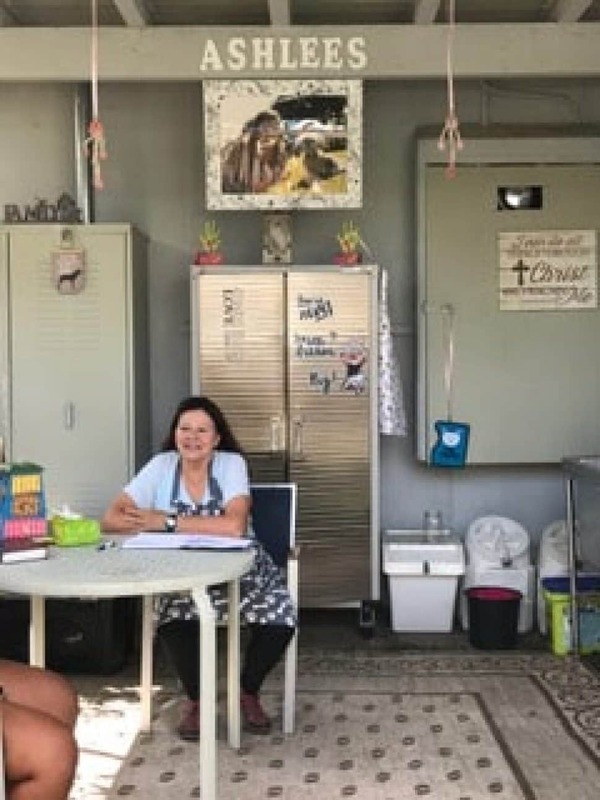 She created her ministry to support anyone facing homelessness in finding resources for and becoming educated about the well-being of their furry family members. “We are their caregivers—they’re helpless without us,” Gisbert said of companion animals—she could have easily have been speaking of her human clients as well. Like most impassioned volunteers, Gisbert works herself to a nubbin advocating for people who need housing that will accept animals; recruiting donors for pet food, veterinary assistance and supplies; getting dogs and cats fixed and finding ways around the obstinacy of people who just won’t; and encouraging people to volunteer around the sanctuary, including several who came to Beacon for Him to find help in the first place. Pets of the Homeless, a national nonprofit that assists homeless people with pet food and veterinary needs, estimates that of the reported 3.5 million people who are homeless, 5 to 24 percent have pets, depending on where they live. Long Beach just completed its homeless count for 2019; the results won’t be published until April, but the 2017 count reported 1,863 sheltered and unsheltered people living within the city. Even at a modest estimate of 5 percent pet owners, that’s nearly 100 pets, and likely most of them haven’t been fixed, which will result in more animals born. As far as the human/animal bond goes, most homeless people with companion animals will choose to remain in the street or a vehicle if offered safe housing that doesn’t allow pets, said Genevieve Frederick, Pets of the Homeless’s founder and president. “The one thing right in her world.” With effort, more will follow. Photo by Jacqueline Gisbert. Frederick added that when an individual has no money for housing and little for food, they cannot provide for their pet, especially if the animal becomes ill and requires emergency treatment. Pets of the Homeless provides this on a large scale and is in fact one of the agencies that helped Gisbert establish Cuddles of Love. Fittingly, Gisbert was motivated by two separate individuals, one human and the other feline, to set up her pet/people ministry. 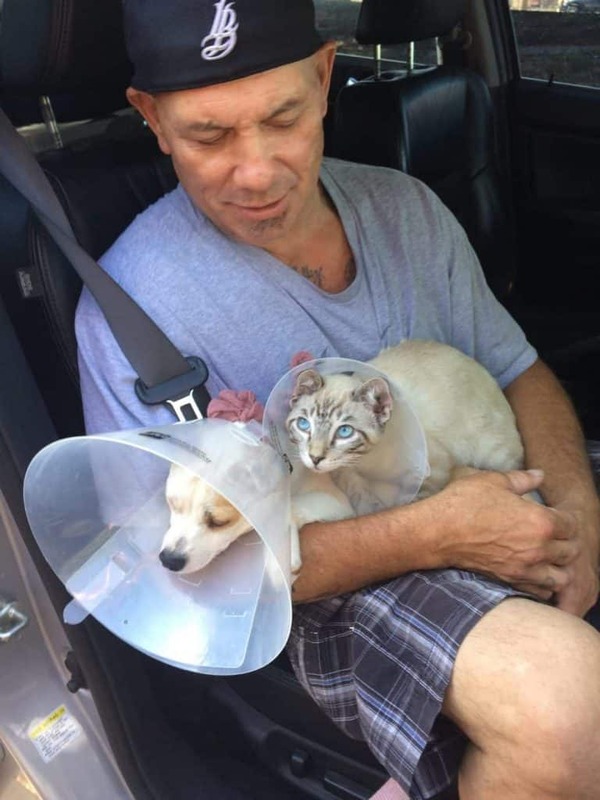 The day that Beacon for Him opened its doors in November 2014, a badly injured white kitten dragged herself onto the property. Another animal had apparently attacked her, and she was cut to the bone. Gisbert rushed the little cat to an emergency vet, where she recovered. She has a name and a home now—Dusty is a permanent resident of Beacon for Him, where volunteers and staff attend to her. “Dusty was our first rescue,” Gisbert said. The other inspiration was David, who had come to Beacon for Him when he was emerging from homelessness. He’d lost his home and his job, and he couldn’t afford vaccinations for his two dogs. Gisbert put her feelers out and found Claudia Hoffmann, founder of Fix Long Beach. Hoffmann offered help for David’s dog as well as another one that Gisbert scooped up from someone else. 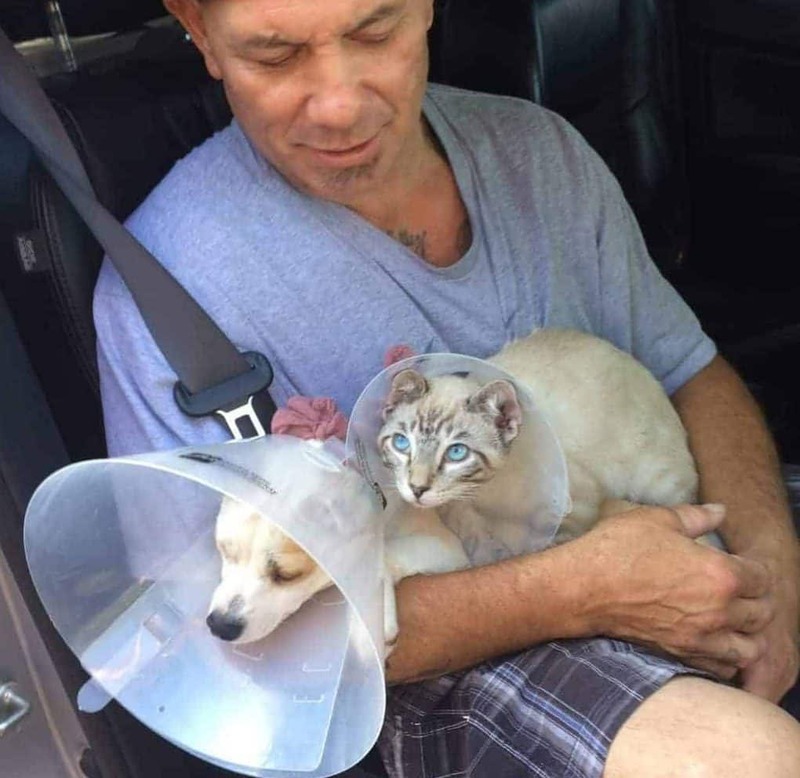 “They fixed their nails, gave him a carrier, food—all kinds of things,” Gisbert said. David is also now a permanent fixture at Beacon for Him. He’s no longer homeless, but he helps with picking up large donations, doing dishes, and clearing up areas. Splish, splash! David, giving a bath. Photo by Kate Karp. 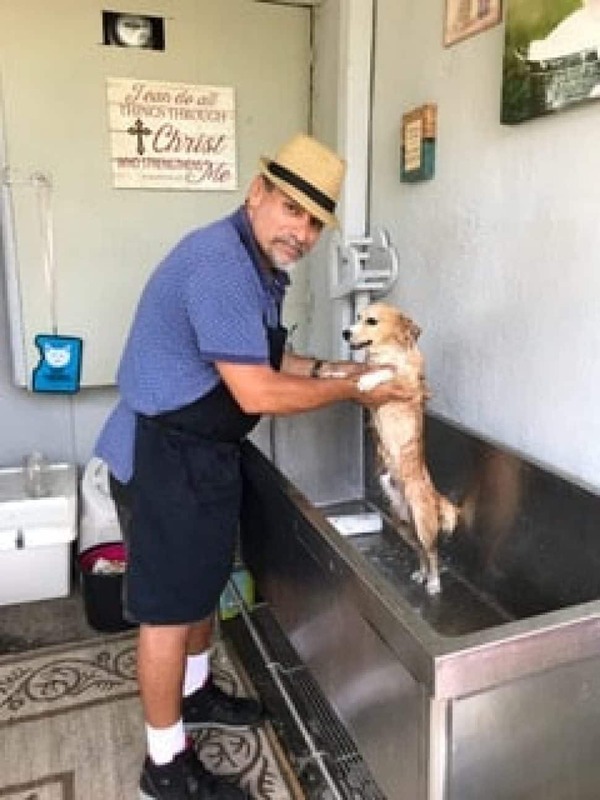 David also bathes visitors’ dogs in Ashlee’s Pet Care, a sanctuary in the backyard of Beacon for Him named for a young woman who died in a car crash. 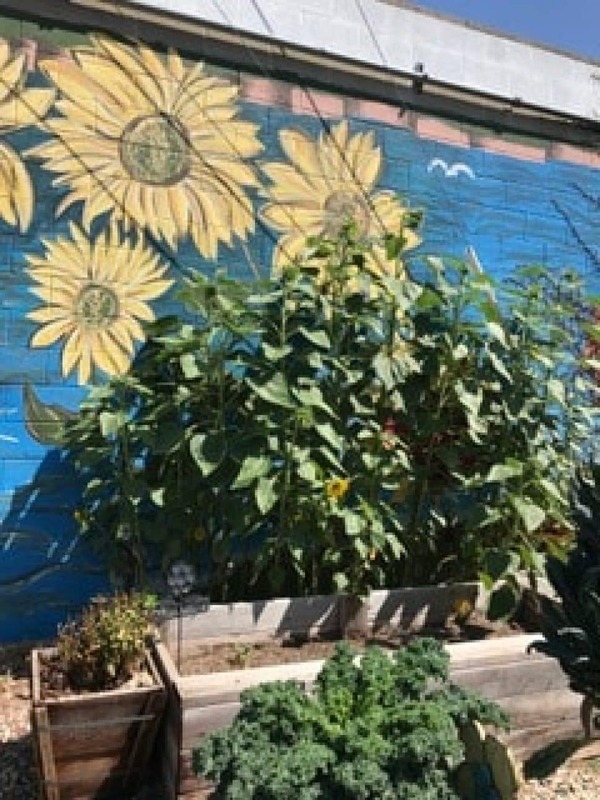 Ashlee’s mother participates in the Bible-study group at Beacon for Him, and her family donated funds to help plant the garden that David and Gisbert work on continually. It’s a refuge where Cuddles of Love clients can sit on benches constructed by Scout Troop 1244 and talk with Gisbert and with one another. The bathing area where David soaps up the dogs includes a tub that the Golden State Humane Society veterinary donated, and there’s a “magic pantry” filled with food, sweaters, pet accessories, flea medications and a few DIY Kitten Care kits in case any neonatal kittens come in. Jeffrey, the on-site handyman who is also homeless, added bucolic touches with his decorations. Photo by Kate Karp. “And leave those cones on until the vet tells you to take them off!” Gisbert ensures that a client gets to a vet appointment even if she has to pack them in herself. Photo by Jacqueline Gisbert. Gisbert said that her initial vision for Cuddles of Love was modest in comparison to the advocacy center it has become. At first, she wanted to provide pet food and information about resources for clients. She discovered Pets of the Homeless during an online search and contacted Genevieve Frederick, who told her that a shipment of pet food had just come in. Gisbert was overwhelmed both emotionally and physically when she went to pick up the food and received a veritable truckload of it. From there, it was giant steps, which Gisbert took in leaps and bounds, to garnering resources for spaying and neutering pets and paying their veterinary bills. Besides Fix Long Beach’s assistance, Gisbert is eternally grateful to Friends of Long Beach Animals, aka FOLBA, for providing her with vouchers for spay/neuter and generously paying any balance of cost that the vouchers didn’t cover. She attracts the good neighbors on Nextdoor.com and receives donations of food, doggie clothing and accessories from them. From all that, Gisbert has evolved as an advocate for people in need. She regularly pulls her car over to talk to people with pets who seem to be in need of assistance. Not infrequently, advocate morphs into activist. 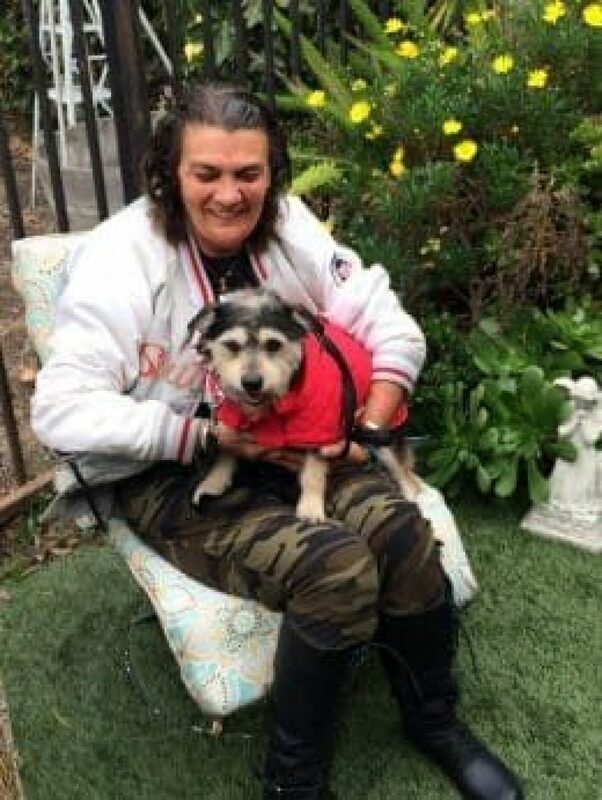 Theresa, a military veteran with PTSD and who has a dog, had applied for housing at a development that serves the military and accepts their pets. When she received word that her paperwork had been turned down, Gisbert marched over to the office and made it clear that she wasn’t going away until she found out why. After planting herself in the office, she was finally told that a paperwork glitch had held up the application for two months. The office staff apologized profusely and promised that Theresa would enter the facility. “And when will that happen, I asked?” Gisbert said. Theresa and her dog moved in the next day. Gisbert may be a fairy godmother, but she’s also been a frustrated Cinderella. Some of her clients agree to appointments for spay/neuter procedures and then pivot on a whim and change their minds. Others flat out refuse to fix their animals, or agree to do so and then show up later with a litter of puppies they plan to sell to fund a drug habit. Cuddles of Love’s success with helping people care for their pets continues to grow, and the word spreads. Gisbert is also hopeful for more pet-inclusive housing to further encourage people to leave the street. She was delighted that the year-round shelter scheduled to open in 2020 will include kennels for pets. The number has yet to be determined, but there’s no doubt that Jacqueline Gisbert will be there if anyone needs help keeping the family together. Thank you, Jacqueline Gisbert, for enduring. Photo by Kate Karp. 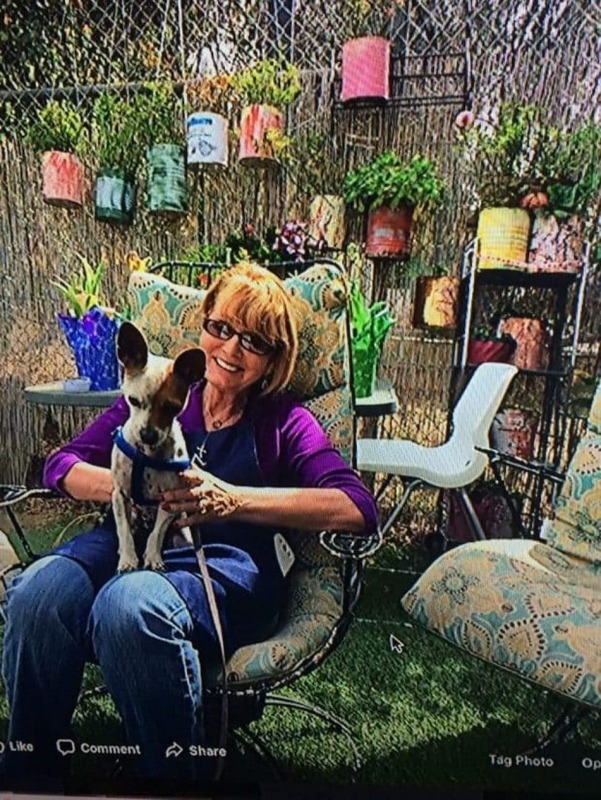 Cuddles of Love and Ashlee’s Pet Care operate on Mondays from 10 to noon at Beacon for Him Ministries, 439 West Anaheim St., Long Beach, 562-591-2299. Access the link to donate, and specify the donation for Cuddles of Love. The organization will gratefully accept donations of cat and dog food, cat litter, harnesses, leashes and anything pet specific.